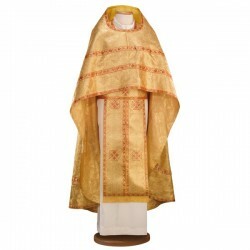 The liturgical orthodox vestments derive from the clothing which was used during the Roman Empire and they are used to mark an office or a function in the Church. According to the strong allegorical vision of the Church (not simboli) about the holy things, the colours have not got a remarkable importance. 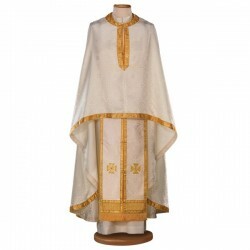 ORTHODOX VESTMENTS There are 2 products. Complete kit of Russian orthodox vestments of broderie woven. Stole, oversleeve, epico natio, belt, phelonion and halice cover. Complete kit of Greek orthodox vestments of broderie woven. Stole, oversleeve, epico natio, belt, phelonion and halice cover. Fused golden cross, cm 12x27, for beam.